"...planks, rope, bicycle chains, nails, everyday objects." Peta Thornycroft on being a reporter in Zimbabwe. Mugabe: "Here's one I prepared earlier..."
In 1982, the Authentic and Consistent Leader perceived that elements of the population in the south west of Zimbabwe were proving less than enthusiastic about his treatment of ZAPU and the integration of ZIPRA and ZANLA forces in the national army. In 2000, the Authentic and Consistent Leader lost a national referendum on constitutional reform. In 2005, although ZANU(PF) was victorious in the parliamentary election, the Authentic and Consistent Leader perceived that the cities had largely voted for the opposition. In 2008, the Authentic and Consistent Leader was made aware that according to estimates based on the vote count at the polling stations, he had lost the first round of the presidential election to one of his two rivals and that, if their votes were combined, he was soundly thrashed. I, like many other armchair observers, have in the past drawn attention to Mugabe's formidable intelligence. I've changed my mind. Nobody in a position of power who ruins a country out of wounded vanity can be regarded as intelligent. His ideological posturing is a smokescreen for his giant, yet fragile, ego. Are there urgent problems that need addressing in Zimbabwe – land distribution, inequality, HIV/AIDS, economic development, social infrastructure? Too right! Will history look kindly on the Authentic and Consistent Leader's contribution to the resolution of those problems? Not so much. UPDATE: Apropos, see this from Norm. Zimbabwe election results - could they be any slower! While everyone has already bitten their nails to the quick in anticipation of the long-delayed election results, this morning's Herald, effectively a government mouthpiece, is reporting the likelihood of a tie in the parliamentary election and a run-off in the presidential race. My guess is that Mugabe would decline to enter a run-off. Although most of the reports flying around are based on rumour, some sources are saying that he has already indicated that he would regard a run-off as demeaning. That means he's either going to 'scrape home' or agree to resign. My money's still on the first, but I'd be overjoyed to be proved wrong. Roundness of earth exaggerated, say SADC leaders. Catholicism of Pope exaggerated, say SADC leaders. And on that farm he had...well not much, according to this report by Peta Thorneycroft from South Africa's Sunday Independent (a shorter version of which appears in the Sunday Telegraph). Francis Nhema is the new chair of the UN Commission on Sustainable Development. See also Norm's links here and here. As a guide to policy, Kwame Nkrumah's much-quoted maxim – "Seek ye the political kingdom (and all other things shall be added unto it)" – has manifestly failed to deliver the goods to numerous unhappy citizenries. Highest year-on-year increases: medical services (11,029.9%), postal services (5,180.4%); hairdressing (4,665.6%). For those interested in the detail of Zimbabwean politics, here are two (long) pieces worth reading. The first is an explanation from David Coltart, an MDC MP who until recently stood back from the split in the opposition party, of why he feels he cannot join the majoritarian faction of the MDC led by Morgan Tsvangirai. The second is an interview with the secretary-general of the 'pro-senate' MDC, Prof. Welshman Ncube. An interesting fact is that the interview appears in the Sunday News, a government-owned paper. Since the MDC began tearing itself apart, the two factions collectively have received a lot more publicity in the local press than they ever did before the split. Here's the website of the majoritarian faction of the MDC. Firefox failed to establish a connection to the ZANU PF website. My own view is that change will come along the lines of the Eastern European experience with a transitional government drawn largely from within the ruling party via a government of 'national unity' to a new dispensation following internationally supervised (or at least monitored) elections. While I am intellectually more convinced by the smaller 'pro-senate' faction of the MDC, they do not seem, at least so far, to have carried the bulk of the MDC's supporter base with them. Personally, as long as the (I think inevitable) transition process ends in an election that is seen to be free and fair, I don't really care who kickstarts that chain of events: MDC1, MDC2 or ZANU PF realists. Some of you (probably not very many) may be wondering about the ruckus that is apparently on the verge of tearing apart the main Zimbabwean opposition movement, the Movement for Democratic Change (MDC). It revolves around whether or not to take part in upcoming elections for the about-to-be-recreated senate. For arguments about whether or not the MDC should take part in these elections, there is a thumbnail sketch of both sides here. The argument pits Morgan Tsvangirai, the leader of the MDC, against the majority of his Executive. I am not a member of the MDC, but my own view is that, as a parliamentary opposition, they should take part in the same way that they took part in the parliamentary elections in March, to which similar objections were raised. In principle, I'd say that if a political party has decision-making processes that are broadly regarded by the membership as fair, then healthy, open debate up until the point of decision-making is a good thing, but once a decision has been made according to fair criteria, members should acknowledge its legitimacy, even if they disagree with it. Any subsequent dissent from that decision should be seen as just that – a dissenting opinion. The problem for the MDC is that, while the main decision-making body of the party voted narrowly in favour of participation, I suspect that the majority of the party base supports Tsvangirai's position that the whole Senate thing is a fraud. Again, my own view is that a bicameral system is a better inheritance than a unicameral system. On a (tenuously) related matter, the UN bookshop in New York sells a little item called the World Satistics Pocketbook, which I picked up a few days ago. It has a host of economic and social statistics listed by country. The last two countries in the 2005 edition are Zambia (page 210) and Zimbabwe (page 211). UPDATE: Re the last line of this post of Norm's, so do I, even though it appears to be a minority position. 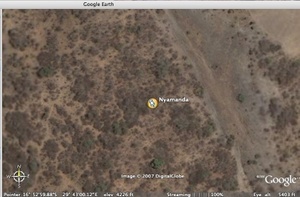 This is a picture of the Jewish cemetery in the town of Kwekwe, Zimbabwe. Although the community no longer exists, the cemetery was reconsecrated in June 2004. More information is available here. The Zimbabwe Jewish community, which now numbers some 292 individuals, still has functioning communal institutions in Harare and Bulawayo. 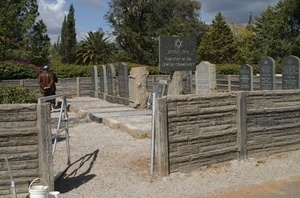 The Kwekwe Jewish cemetery is maintained on their behalf by the Kwekwe Muslim community.